Even before Kim Hochstedler (DC’18) received her Carnegie Mellon University diploma, she was racking up achievement honors. Hochstedler, who double-majored in statistics and psychology, was also active outside of the classroom. She was on the varsity swimming and diving team and student athlete advisory council and a committee member for the Special Olympics of Western Pennsylvania Spring Sectional, student researcher in the Gender, Relationships and Health Lab, teaching assistant in the Psychology Department and swim instructor and lifeguard for the Athletics Department. For doing it all at the highest standard, Hochstedler received the Judith A. Resnik Award, which honors the CMU alumna and space shuttle Challenger astronaut and is presented annually to an outstanding woman graduating in the sciences or engineering who plans to attend graduate school and whose academic performance, creativity and vision illustrate potential for high academic achievement in her field. She was also named an Andrew Carnegie Society Scholar and awarded the Dietrich College of Humanities and Social Sciences’ Gretchen Lankford Award, a prize that recognizes outstanding academic achievement and is granted in support of a graduating student who plans to pursue graduate education and a career in teaching. Additionally, she won a Carnegie Mellon Women’s Association Scholarship and an NCAA post-graduate scholarship and the Dr. William Brown Academic Athletic Achievement Award, which is given to the CMU female student-athlete with the highest cumulative GPA. Hoschstedler shared that she was extremely grateful to be recognized with these awards. One experience that stood out for Hochstedler was working in Psychology Professor Vicki Helgeson’s lab. Hochstedler was involved in multiple research projects, presented at two scientific conferences with Helgeson and worked with her on a Summer Undergraduate Research Fellowship and Dietrich College Senior Honors Program thesis. “Professor Helgeson has been supportive outside of my academic and research career as well—she attended a couple of home swim meets to cheer me and my teammates on,” Hochstedler said. Helgeson said Hochstedler is a very bright, hard-working and motivated student. “Put simply, Kim is one of those students who comes along about once every 10 years. She is intellectually engaged in scientific research beyond her years. She is incredibly mature, responsible and organized. She is on the swim team and manages to stay on top of things, despite missing school—sometimes an entire week—for swim meets. She not only keeps up – she excels! And she sleeps at night! This is where the maturity comes in,” Helgeson said. Next for Hochstedler is graduate school. She will pursue a Ph.D. in biostatistics at the University of Michigan. But for current and future CMU students, she shares simple, yet critical advice. 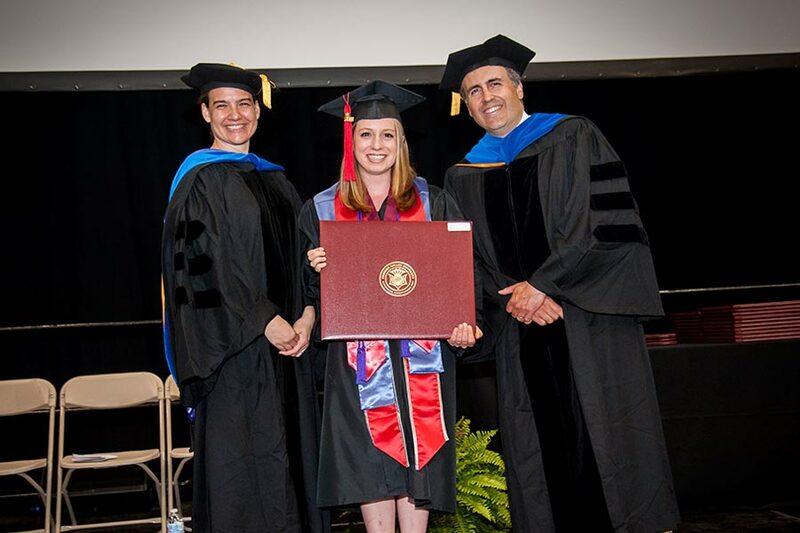 Pictured above is Kim Hochstedler (center) as she receives her diploma from Associate Head of the Department of Statistics & Data Science Rebecca Nugent (left) and Department Head Christopher Genovese.